Last time, I talked about this process that I call the “Winter Counts” which arose out of the character creation process found in Ehdrigohr: The role-playing game. I figured it was worth it to break down how this process actually works for me so that groups could try to do it with their own circles. I’m open sourcing this so that any community or group might benefit from the ideas in it. I hope that tribal and indigenous groups might take to it and that it can find a place int he toolbox of their educational work, youth work, or any healing work that they endeavor to engage. The goal is a process that gets people thinking about where they have been as process of growth and history and affirmation. The experiences of our lives have left us with a toolbox of lenses that we can use to better navigate our worlds, and which we can use to design pathways around the obstacles in front of ourselves. I feel that, just as we use what has gone before to create heroes of merit in our role-playing games and fantasies, so too can we find heroes and wisdom in our real-world personal backstories which bring us to where, and who we are now, as we begin new journeys. If you can imagine yourself doing the impossible, then you can design a path to you doing, what others deem, the improbable. Determine how much time you can devote to this process. If this is a large group that you’re looking to return to over a number of days, you can use a variation of approach 1. If this is a small workshop where you’re only able to get participants for a few hours use approach 2. Index Cards and a cork board or some other places to attach them. Any wall where you could tape index cards. Why “Winters” – a primer. If you’ve ever lived in Chicago, or in any place where winters are intense and volatile, you’ll understand the capacity for a winter to test your mettle. In the context of the Winter Counts exercise, the point of them is that they are moments of survival. Winters are special in that they have this way of stripping you down, leaving you bare, and making you look at yourself in personal quietude. They are not comfortable. We don’t always like what is shown to us about ourselves in the harshness of our Winter moments. Also, when a harsh winter is over, one meets the first warmth of Spring with joy and open arms. 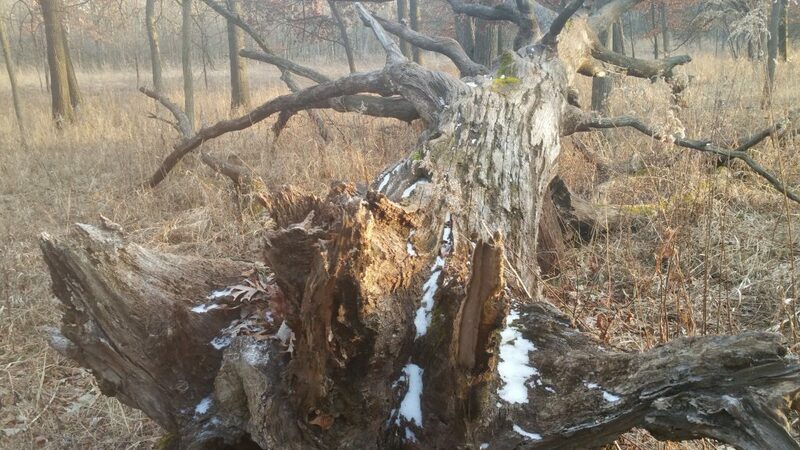 Look at the way most trees move through winter. Their covering of leaves falls away, a bit at a time, until they are left uncovered. At this point, you can see all the scars and boles that have come from the year’s growth. You can see the new branches that had been hidden by the leaves. The weakest of these are blown off. The debris is cleansed by the snowfall and blown away by the cold winds. What survives is a stronger tree that puts on a new coat for the world when the spring comes. In the traditions of the Lakota Oyate (The Lakota Nation) winter was the thing you kept track of to see how the people survived. They maintained a Waniyetu Wowapi, or “Winter Count”. These were visual calendars that marked the passing of a year naming the year after the most notable events. Each year had a picture and a name. At a glance the people could see the history of how they’d grown and survived and what had kept them strong. They were aware of their narrative through the world and in relationship to the world. When multiple bands came together they could compare their winter counts and get a bigger picture of the world by seeing their counts in parallel with each other. I’ve used this process to work with groups of people to look at how they have moved through the world, what has broken them and what has made them stronger. It asks them to look at what qualities they have taken from the major moments in their life that they carry with them as lenses through which they view the world. Sometimes it is enough to just walk through some personal narratives and get people seeing each other in parallel and how they share so much. Other times it is good to walk through a longer process of this to get people to own their narratives and to see themselves as thriving warriors moving through struggles and getting stronger. In this approach to using the Winter Counts. We assume we have a bit more time to work with participants with the idea that we have some period for process in between sessions. This could be a whole day, or maybe it could be the afternoon vs the morning. In the first session, you begin by establishing a greeting circle. Get everyone to introduce each other. If they are open to it, get them to talk a bit about why they are here at this gathering. If the gathering has a theme, possibly ask them to talk a bit about how the them applies to them. If someone doesn’t know. They don’t know. You are the vision keeper and the space holder in this space. Establish that there is only one voice at a time. If a participant is particularly moved by something a speaker is saying, they should hold their voice and respond as the poets do, with finger snaps. This is because that everything we do here is poetry and life. Introduce the idea of the Winters Counts to the circle. Pass out index cards to every table or grouping of people. 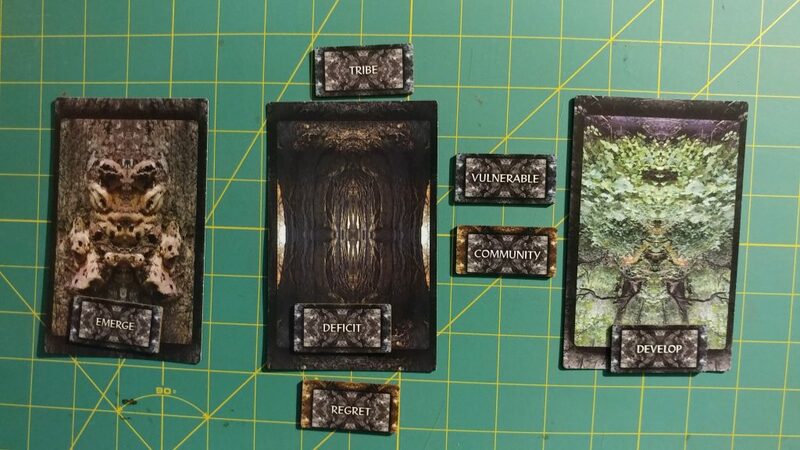 Put one or more Arboretum Imaginarium cards decks down for people. Explain that, as you call off the details of the Winters, you want them to write about that they should do a few things. Ask them to write briefly about this. Name the moment “The Winter of…” and make the remaining portion of that statement a poetic phrase that describes the experience. Look through the cards and find an image or words that describes how you felt or what you felt that experience gave you. When everyone is done, have each participant read off their Winter. As they do so write, or pin, the winter up on the white board or display space. Ask them to talk about the feeling or quality that the card represents for them. Do this with everyone before beginning the next winter. Take time to give witness and space to winters with strong emotions attached. If there is room on the board write the words and qualities down on the board. If you have enough cards to do so, put the images up at the board near the winters. If you don’t have enough room, have the participants gather the cards at their table together and take an image of those cards. Arrange the cards into a circle when you do this, we want to introduce the idea of everything being in relationship with everything, and this is a good place to start. 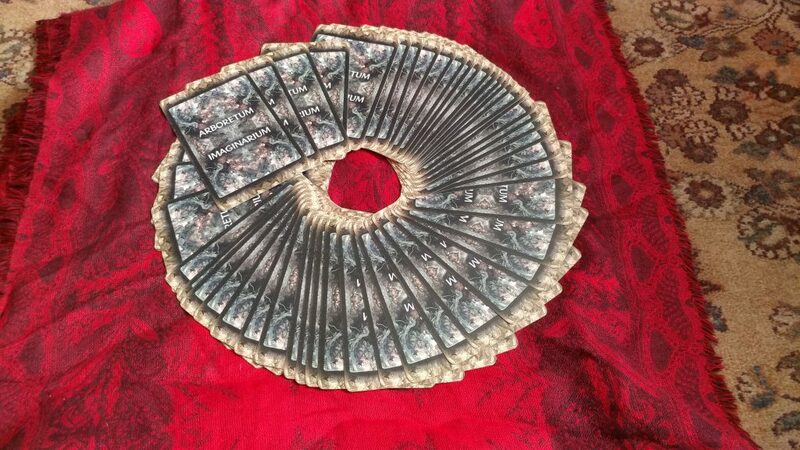 Once the pictures are taken, you can put the cards all back in the deck and begin the next Winter. Do this for every winter you intend to do with the group. As you get more and more winters up, take the time to look at the commonalities of their experiences. This is especially potent across generations or cultural/racial/gender divides. Look at their differences, again very potent across generation/culture/racial/gender divides. Continue this approach up until near the end of your first session. Make sure everyone keeps the winters they wrote down on index cards. 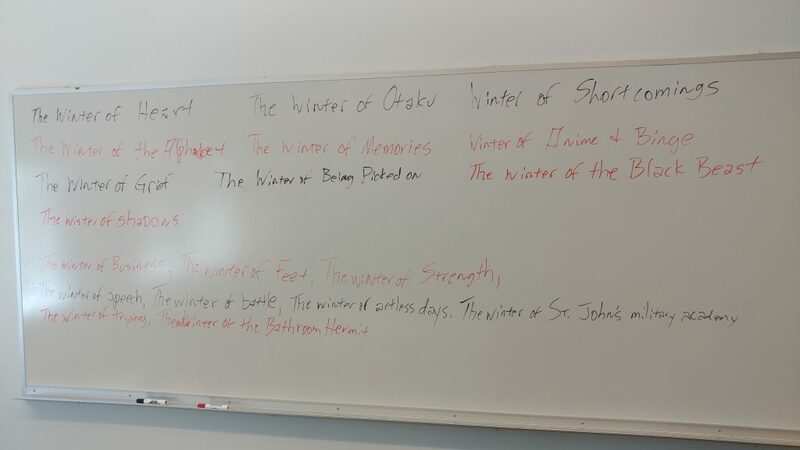 As you come to the end of the session take a moment to look at all the winters on the board. These winters represent a shared history. We are beginning a new circle and the circle exists because we all moved through these moments. We were given gifts and lenses that helped us to see our way to this moment. Everyone here can find a winter that they can relate to. Perhaps for some there are winter’s that they might have had themselves but moved through differently. We can continue to build off of the energy of these winters and design our way through the world using the qualities that we took away from our winter. Ask people to think about the qualities they feel they took from their own Winters and use them to make a sort of “I am” poem. This poem is to be used to re-introduce themselves to the group as a heroic figure, a legendary figure. Then call out the winters as follows. Do this for each winter. The first verb is a word like survived, struggled, cried through, overcame, held strong, laughed, etc. The second verb is something like learned, gleaned, discovered, became, etc.. It may help to come up with some word lists to help people who struggle with these kinds of things. Each person is to reintroduce themselves to the circle with their poem read aloud, while they present themselves to the group. When a participant finishes their poem. The group responds as follows. When all are done. The group leader should welcome all to this circle of mighty creators and reintroduce the theme of the group and maybe begin to present any issue that they can bring their wisdom to bear on. At the end of the session thank the circle for their counsel and wisdom in moving through ideas, plans, and energies. If the group meets multiple times open with this circle. If need be, name it, to make it a thing that is about them. They have to own it, and believe in it, as a tool to focus them. Over the course of multiple sessions take note of the qualities people said they gleaned from their winters. When people seem beset or unsure, bring these qualities out in discussion and ask how they would help in this session. If you have kept track of any cards used, play the card on them. Suggest this is a moment of that quality. Ask if they can re-approach it from a different angle with that quality in mind and design a new way of engaging the situation. Invite people to return to the box of cards from time to time. If they see a place where their own claimed quality can make a difference, play the card in the center of the circle to gain voice and be heard. Continue to use the card’s words and images. Use them in the circle to direct people’s attentions, ensure that people are heard, and bring quiet and focus when needed. Use them in every opening circle to get a sense of what energies and emotions people are bringing to the conversation that day and make them visible. Don’t do more than 3 winters. It takes a lot of time to do these with integrity. Focus the winters on moments keyed to your workshop theme. Focus in on how these experiences connect the participants to the big ideas of the themes. 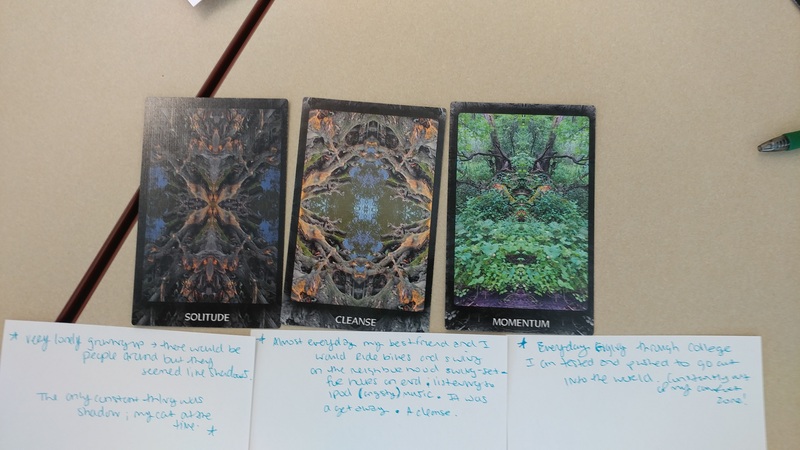 Have them note the words/images/qualities they feel have come from the Winter and think about how they can use these as lenses to help them receive the experiences of the remainder of the workshop. If some represent barriers, ask them to try putting them away. If some represent strengths, ask them to try to use these in service of themselves and others in the room mindfully as we move through the remaining workshops. If some qualities stand out big among most of the participants, write them down on the board. Over the course of the workshop, make a point of putting a star next to these qualities every time they are called into play to help underscore how important they are. These are the qualities they will need to develop skills in or build circles of support that have these skills to share. Skip over the “I am” rite of passage as you won’t have time to make that portion a meaningful experience. We all begin somewhere. Childhood can be tough. The truth is that many don’t make it past this point. What was special about your childhood that made you strong enough or safe enough to make it through intact? Write a few sentences to summarize what stood out to you about this winter during this winter and how you survived it. Name the winter, call out the quality that you got from it. The adolescent years are some of the most harrowing times of a person’s life. It’s a time when you’re trying to figure out who you’re going to be. This is the time when your ideals and habits often become established. What shaped you as an adolescent? Was there a particular person or incident that shaped your interactions with, and perceptions of, the rest of the world? Perhaps something you did shaped the way the world interacts with and perceives you. Write a summary of this Winter, and name it. 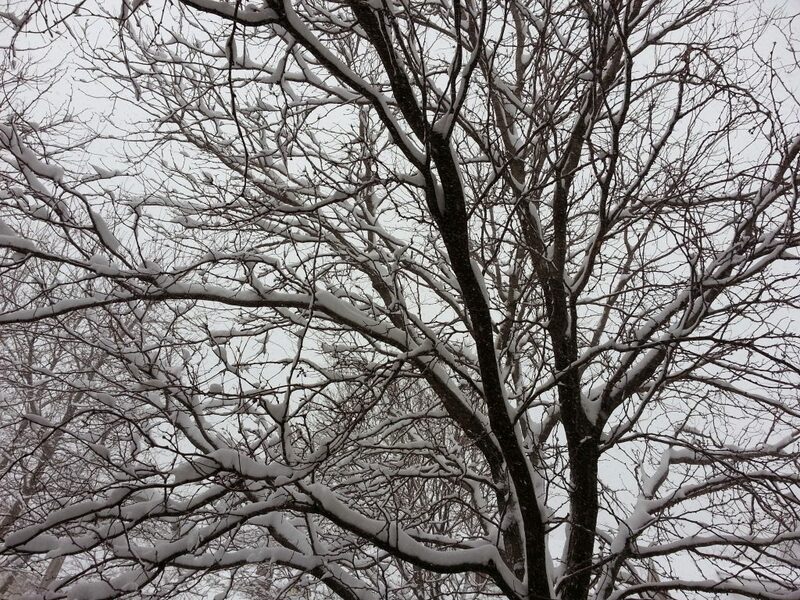 Then describe a quality that sums up what is important about this winter in relation to you. Remember that this could be about another person as well as an item or location. Was there a mentor, rival, or oppressor? A secret meeting place among friends, a special inheritance? This is your Aspect of Becoming and is easily invoked and brought into scenes. Life is rarely static. Whether you come from one of the few big towns or cities in the world, a small neighborhood, or a quiet town. Eventually things change and your comfort zones are tested. When was the first time you really remember being pushed out of your comfort zones? Describe the experience and what qualities come from it. Community is important. Very few people survive the worlds rigors alone. Your many adventures have brought you into contact with myriad people who have become relatives, chosen family, for better or worse. Think about a time when the you made a really strong connection with someone, however long or brief it might have been. Talk about why it came to be and why it meant something to you. Describe the quality that stuck with you from this relationship. The Mysteries touch everyone and are a constant part of our lives and our actions. Call it whatever you will, sometimes you are at the right place at the right, or wrong time, and see into the majesty and workings of existence. It activates you and makes you think you can do wonders. It may be fleeting or it may still be going on for you. It, however long it lasted, gave you a moment of yes (and maybe even a moment of fear). What was it? Why did it affect you that way? Name it and describe what quality sticks with you from that experience. Note that not every group is ready to explore awakenings. Take stock of where the group appears to be before moving into this one. There are terrible things in the world. Sometimes we are unlucky enough to come face to face with a thing, and idea, a person who breaks our sense of safety and gives us a seed of fear or distrust, or anxiety that even now has us looking over our shoulders. Whether real, or imagined, that thing affected you. What was it? Name that winter. What fear did this bring to your view of the world? Note that, like awakenings, not every group is ready to engage this one. Take stock of the group. If it proves to be uncomfortable or too vulnerable making don’t’ press. Move on to something else. Arboretum Imaginarium, Ehdrigohr, Featured, Winter Counts. Bookmark.